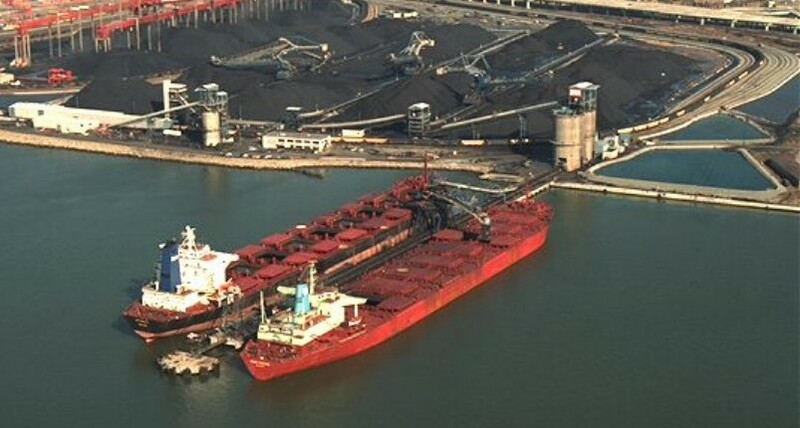 Houston — Dominion Terminal Associates loaded and exported 328,780 st of coal on six vessels at its Newport News, Virginia, pier in the week ended October 26, while another one is docked there, company data showed Friday. The terminal, which is owned by Arch Coal and Contura Energy and served by CSX, loaded the Aurora Confidence vessel with 85,748 st of coal on Saturday, the DTA data showed. The ship is expected to arrive in Algeciras, Spain, on November 1, according to cFlow, Platts trade flow software. On Sunday, the Almeria departed with 59,429 st of coal and is expected to arrive in Raahe, Finland, on November 7, according to Platts cFlow and DTA data. The AS Elbia, which loaded 6,395 st at DTA, also left on Sunday, with 65,824 st of coal (59,429 st loaded at different terminal) onboard. The ship is scheduled to reach Gijon, Spain, on October 31, according to Platts cFlow. The Santa Maria loaded 46,487 st on Wednesday, left for La Plata, Argentina, and is expected to arrive there on November 13. Roughly 86,416 st was loaded Thursday onto the Puma Max and is scheduled to reach Tubarao, Brazil, on November 10, according to the data. On Friday morning, about 44,305 st was loaded on the Imperial Frontier, which left for Port Said, Egypt, and is expected to arrive on November 11. The New Explorer is currently anchored at the pier and is expected to load 83,444 st. As of 11:30 am EDT, the ship had loaded 15,430 st. There are three vessels that are estimated to arrive at DTA Friday to load 238,336 st, while another ship is expected on Saturday to load 86,751 st.
Of those four ships, two are currently anchored near Cape Charles outside of Hampton Roads. Including the two ships waiting to load at DTA, as of 11:30 am EDT, there are 10 vessels anchored near Cape Charles waiting to load coal at one of the three coal terminals, according to cFlow. This week, 2,770 rail cars, or roughly 25 trains, dumped 318,403 st, including 229 cars with 25,890 st, on Fridayl, as of 11:30 am EDT. Tuesday was the busiest day for the terminal, which saw 508 rail cars dump 58,289 st of coal, followed by 506 rail cars that unloaded 58,261 st on Thursday. So far this month, 21 ships have left DTA with 1.22 million st onboard. In September, 17 vessels carrying 1.15 million st departed DTA, down from a four-year high of 25 vessels with 1.6 million st exported in August, due to a near week-long disruption from Hurricane Florence. Since January 1, 196 vessels have left DTA with nearly 13.07 million st of coal onboard. Including the departed and anchored vessels, DTA currently has 33 vessels scheduled to arrive in October that will load nearly 1.99 million st of coal, while another 22 are estimated in November to export 1.43 million st, according to the company data. DTA is the second largest of the three coal terminals in the Hampton Roads region. In 2017, the terminal exported 12.82 million st of coal, up 65.8% year on year, according to data from the Virginia Maritime Association. The 12.82 million st was only behind Norfolk Southern-owned Lamberts Point, which exported 14.77 million st.